Are you trying to compete locally and think that having domain privacy is helping you? I am under the impression after reading a number of articles from Google, along with their filed patent from 10 years ago that this WHOIS information may be important. You just never can tell. To understand WHOIS. It is a listing of the site owner, the administrator and the technical support person. This information should be valid according to ICANN and your registrar. The common problem with most novice domain owners is that often they leave it up to a web designer or marketing company to purchase the domain for them. The big no-no here is not being listed as the domain owner (regsitrant). If you don’t own the domain (the registered owner) you may have problems down the road should your webmaster go out of business, run off with your domain (after you paid them to market it) or have it held hostage by a marketing company. 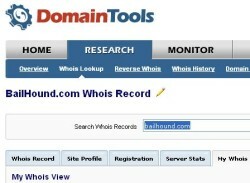 The easiest way to tell if you own the domain is to do a simple WHOIS lookup. The service is free and will tell you quite a bit about the domain. Administrative Contact: Who administers the domain? This again should probably be your listing. Technical Contact: This could be your webadmin, SEO or other. Best to simply leave this information as you had for Registrant. If you see someone else’s name as the registrant get that information changed immediately. Also be sure the domain is listed in your registrar account (NameCheap, GoDaddy, etc.). Now on to the SEO side of placing the address you want to rank locally for. This should be the same address (exactly) in Google Local/Places, Yelp, YellowPages, YellowBot and other directories where you list your business address. Google is on record as stating they dislike fake WHOIS records, which may suggest that WHOIS is a strong component in determining local search quality (localization) and quite possibly a major tool for Google’s antispam team. Google’s patent was filed almost 10 years ago, and some of the information is certainly coming to fruition. Then again, some of the terms and descriptions, IMHO, may have been just a glimpse of what they want to do with localization search. Valuable (legitimate) domains are often paid for several years in advance, while doorway (illegitimate) domains rarely are used for more than a year. Therefore, the date when a domain expires in the future can be used as a factor in predicting the legitimacy of a domain. So, it is in my opinion that just maybe, there is something to having your local listing match your true local listing across the interwebs.